Hog Law is a law firm specializing in representation of those injured in motorcycle accidents throughout Tampa Bay and the state of Florida. Attorney Bradley D. Souders, a biker himself, understands first-hand the devastating impact a motorcycle accident and injury can have on you, your livelihood, and your family. Combined with outrageous legal fees charged by other lawyers and lack of personal service at other law firms, filing a claim can be an exhausting and agonizing process. But it doesn't have to be. At Hog Law, we are committed to easing your burden by offering personable and affordable legal representation from someone who knows where you've been and understands your pain. Why go to any lawyer when you can be represented by one of your own at Hog Law? With Hog Law, you will have an experienced attorney AND an experienced biker on your side. 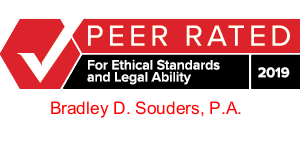 In his 25+ years practicing law, Brad Souders has received the highest of peer review ratings and continues to provide legal counsel throughout the state of Florida at reduced "Biker Rates." 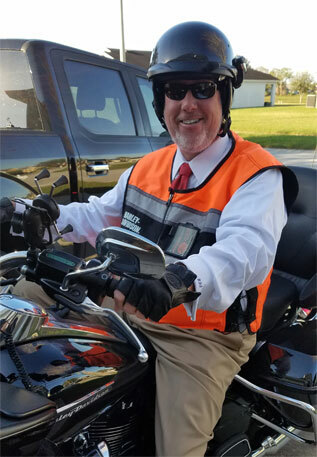 He has represented bikers injured in motorcycle accidents in Tampa, St. Petersburg, Clearwater, Orlando, Ft. Walton Beach, Boynton Beach, and across the coast to Daytona Beach, Fort Lauderdale, and Miami, thus earning the reputation as "THE Motorcycle Accident Lawyer" in the state of Florida. The most common types of motorcycle accidents involve those where a vehicle is making a left turn in front of you, violating your right of way; or, a rear-end accident, either causing the motorcyclist serious injuries or death. Damage to helmet, jacket, gloves etc. Most bikers are especially concerned about their bike and getting it fixed; or, having it declared as a total loss, for quick resolution to getting back on the road as soon as possible. Other questions might be related to obtaining a rental car, or finding a doctor who takes motorcycle accident cases, or finding a lawyer experienced in motorcycle cases, injuries, and settlements. For general guidance, please review our Frequently Asked Questions page. BRAD IS "AV RATED" (THE HIGHEST RATING) BY MARTINDALE HUBBELL®, HAVING BEEN RATED BY LOCAL JUDGES AND LAWYERS, REGARDING HIS SKILL, KNOWLEDGE AND REPUTATION AS AN ATTORNEY. Brad has been a biker all his life, riding since childhood (three decades and counting!) Read more about Attorney Brad Souders. Read more about Brad on his separate BIO page. THE LAW FIRM REPRESENTS INJURED BIKERS THROUGHT THE STATE OF FLORIDA. Contact Us for more information about our location, mailing address, and for a map to our Tampa office. FREE CONSULTATIONS AND IF THERE IS NO RECOVERY, NO FEES OR COSTS. You are welcome to call on either one of our toll free numbers to speak directly with Brad about your accident, damages, insurance, and other questions you may have. DON’T PAY 1/3 OR 40%. OTHER LAWYERS MAY CHARGE EITHER RATE, THE MAXIMUM RATES ALLOWED BY LAW. Brad Souders is a "Biker representing Bikers" and has a strict policy of representing bikers at a reduced rate of 30%, plus "case costs" (expenses incurred in pursuing the claim), regardless of whether the case settles before or after a lawsuit. THE BOTTOM LINE: At Hog Law, we are committed to helping you get your life back. Call today at 1-866-HOGLAW1 or 1-800-254-5155 to see if we can help you! HOG LAW PROUDLY SERVES BIKERS THROUGHOUT THE STATE OF FLORIDA. HOG-LAW utilizes state-of-the-art tools to help YOU find the most experienced and qualified motorcycle attorney in YOUR STATE, who can best represent you, the injured motorcyclist; or worse, family members who are in need to hire an attorney for a wrongful death claim. Simply contact Brad toll free during business hours (800) 254-5155, on his cell phone (813) 220-7767, or by email at brad@hoglaw1.com. Providing HOG-LAW with the accident details, allows us the information to help you. By commitment and dedication to the motorcycle community, as a fellow biker, Brad takes pride in personally assisting you to find the very best attorney possible to handle any out of state claims. The goal is simple, HELP YOU find the best attorney in your area, in your state, in your county, close to your home, who is the most AGGRESSIVE, who also has high peer review ratings, to get you the justice and recovery you deserve. 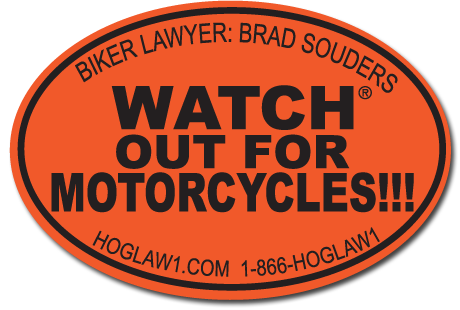 As a fellow motorcyclist, attorney Brad Souders wants YOU to have the very best, to right the wrong!